We have chosen to represent our Badger gear in the best way possible, on real Badger fans! All our clothing models are members of our community, either customers, employees, or current students at the University of Wisconsin-Madison. Our biggest modeling initiative is the Model of the Month program. We began the program in 2012, offering an opportunity for the students of the University of Wisconsin-Madison to represent their campus. Twelve students, one for every month, are chosen yearly through an application and interview process. These are the very models you see throughout our website! The student models are enthusiastic and we are happy to provide this fun and different experience. Each model brings their unique personality to this campus, our clothing, and the community. We work with the models and give back to a charity of their choice as a thank you for the work they share with us. This year alone we have donated to the Dane County Humane Society, Centro Hispano of Dane County, and the Madison Music Makers among others. Please click here for a full list of the charitable organizations we have worked with. Visit us on Facebook to participate in the donation process. 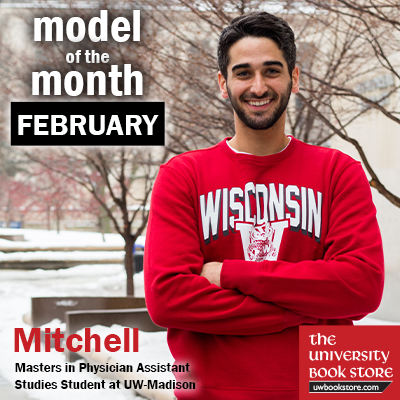 Interested in joining the ranks of the University Book Store Models of the Month? We’d love to hear from you. We are now accepting applications for the 2018-19 school year. Any student who will be enrolled during the upcoming school year is welcome to apply at the link below!